Gary, Tulisa and Kelly step out as the new judges at the first X Factor auditions 2011. 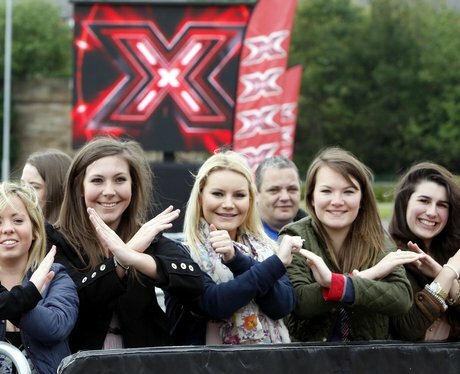 Crowds at the SECC in Glasgow, Scotland ahead of the X Factor auditions in the city. Louis Walsh arrives at the SECC in Glasgow, Scotland ahead of the X Factor auditions in the city. Dermot O'Leary arrives at the SECC in Glasgow, Scotland ahead of the X Factor auditions in the city. Kelly Rowland arrives at the SECC in Glasgow, Scotland ahead of the X Factor auditions in the city. Hopeful performers queue as X Factor judges arrive for the first auditions at the LG Arena, Birmingham. New X Factor judge Gary Barlow arrives for the first auditions at the LG Arena, Birmingham. New X Factor judge Gary Barlow is cheered by performers as he arrives for the first auditions at the LG Arena, Birmingham. X Factor judge Louis Walsh arrives for the first auditions at the LG Arena, Birmingham.